This graphic portrays a common feeling students might have in regards to standardized tests. Standardized tests disregard the different mental health, cultural and language backgrounds that could affect the outcome of a students test. Students that take standardized tests are all treated as the same and are all expected to have one standardized test measure their intelligence which in so many cases is not true. Am I failing… or is it the test? Many students have been taking standardized tests since 3rd grade. Standardized tests have no value for diversity whether you have a different learning style, background, language proficiency, mental health state, or socioeconomic status; these tests treat all kids as if they are the same. “I have this thing where every time I take a test even if I studied for it I forget when I see it because of the stress and I’m scared I’m going to fail, so every time I took the test I always did really badly,” explained sophomore Nasra Hassan. Standardized testing can be harder for people who have mental health issues and can cause stress and anxiety. About 16-20% of students have high test anxiety, making this the most prevalent scholastic impairment in our schools today. Another 18% are troubled by moderately-high test anxiety, according to American Test Anxieties Association (ATAA). “[A person with test anxiety] might normally have calm thoughts, they can use their memory, they can retrieve information that they have learned in the past, but in a testing situation for some reason that is a trigger for some of their chemicals in their body to go askew and they don’t think in that clear way that they are used to feeling… their anxiety gets in the way of the information in their brain and being able to demonstrate it,” said Liz Rudrud, South psychologist. It’s not only challenging to take standardized tests for people who have test anxiety but can also be more difficult for people who already struggle with mental health. “It can be harder to take standardized tests if you process information more slowly than somebody else. If you have a diagnosis like anxiety, ADHD, depression, if those things cause you to think more slowly, if you need more time to get your thoughts straight it can make a timed tests more difficult for you,” said Rudrud. There are a wide range of people who take standardized tests. Although some students may have different cultural backgrounds or different levels of proficiency in the English language, standardized tests treat everyone as if they are identical. It can be much harder to understand and get good results for someone who doesn’t speak English as their first language. “I didn’t speak English that much so it was hard [to take a standardized test] I had to call the teacher and ask her to help me but she said she couldn’t. I had to figure it out by myself,” said sophomore Abib Ibrahim. There are too many different kinds of people who take standardized tests for them to be a fair way to measure someone’s intelligence. If students can’t speak English well enough to understand the contents of the test why should they be pressured to take it? Why should it make or break whether they get into college, and therefore have more opportunities for their future? “Standardized testing? I don’t like it. As an English Language Learner (ELL) teacher I think standardized testing is inherently biased so I don’t see how we can grade all students with one magic test,” said Aaron Blum. “First of all [non-native English speakers] a lot of the time misinterpret questions or they can’t understand concepts because the language is too difficult or they are not reading at a grade level, and second of all I don’t think they have a lot of practice on tests because they haven’t done it their whole life. Third of all they just take a lot longer to process the questions,” he continued. Some people also have different learning styles. Someone could learn well while taking a test but other people may not learn at all from taking tests and would be more successful doing something hands on like a project-based assignment. For example, the Open program at South has more project-based assignments compared to the Liberal Arts program, which has a more traditional test-focused teaching style. Some students might do better in Liberal Arts because they are good at tests while others might fit better into the Open program because they are more physical and visual learners. Standardized tests are also biased towards wealthier students. The standardized test companies– a multi-billion dollar a year industry– don’t just make the tests, but they also make the courses and programs that help students prepare for the test. You can get special tutors that will help you do well on the tests if you have the money to pay for them. Unfortunately, students who aren’t able to pay for test prep also often go to schools that have fewer resources. Students at schools in low socioeconomic areas get less funding than rich suburban schools does. If you don’t have enough money, then you’re not going to get the same preparation for the test as those at the higher socioeconomic levels who go to wealthy schools do. 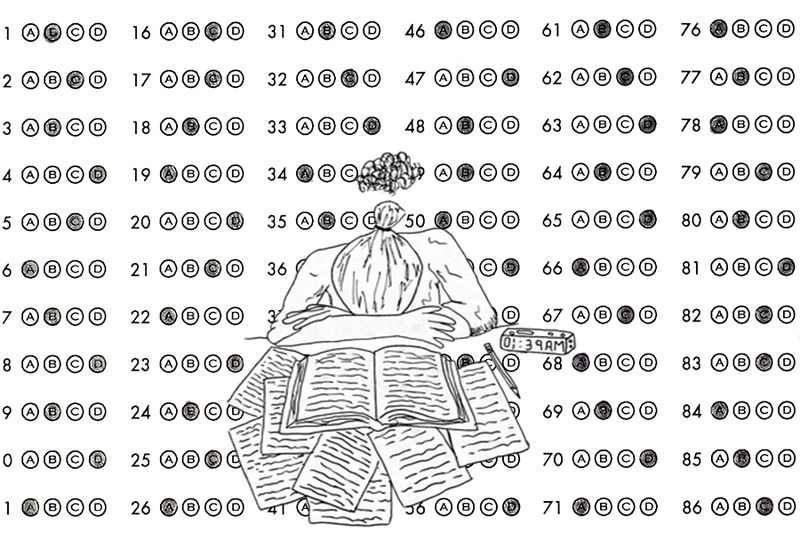 So what could we use as a replacement for standardized testing? According to an American University report on replacements for standardized tests, game-based assessments would be a good option because instead of just measuring student knowledge on a topic they measure thought process and skills as well. Students play games that simulate a topic they are learning in school and the games draw direct data provide streams of data that allow assessment of process as well as the final product. They also measure creativity, collaboration, and persistence…“Game based assessments gather data on student performance without requiring the student to stop their learning activity and take a test, the report said.” Games can also measure creativity, collaboration and persistence that standardized testing might not be able to measure as well. “I just don’t believe that one test is going to tell us [the student’s academic ability] we can’t use that to create an entire curriculum or entire standards we have to, as teachers, constantly be walking around the [class]room and giving different kinds of tests… I think projects are a great way of assessing how a student is doing,” said Blum. It’s hard to test a large variety of students with one test. So if we gave students different options for ways of proving their understanding of a subject, they could choose the one they think would work best for them.